Before teachers can start using Lernio, the school admin needs to create an account for them and assign classes/grades and subjects to them. Only the school admin can create teacher accounts. Go to the Teachers section from the top menu and click + to add a new teacher account. 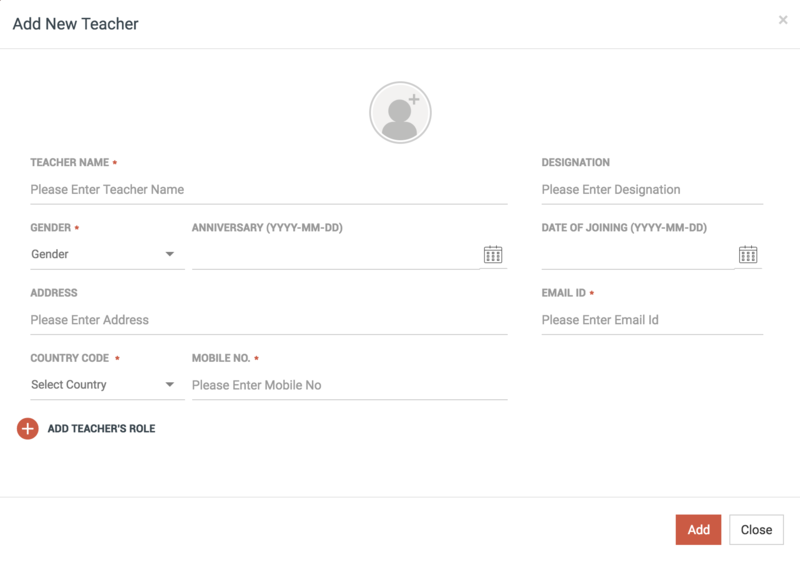 Step 2: Fill teacher details in the pop-up form. Make sure to assign classes/grades and subjects under this section. You will not be able to save and create the teacher account until at least one grade/class has been added. Start by clicking the + sign. You can also assign a teacher to be class teacher for a class. Only a class teacher can mark attendance for a class/grade. You can come back later to change classes/grades and subjects at any time. If a class/grade or subject is removed from a teacher, the assignments and activities already created remain unaffected and continue to be available to parents. Click Add at the bottom to save and create the teacher account. Repeat these steps for each teacher account to be created. The same Lernio app works for parents as well as teachers. Automatically teacher features are available when the teacher logs into the mobile app. Everyone logs into the mobile app via an OTP received on their mobile number. See how to login. Upload activity (photo or video) and tag students in them. View timeline, calendar, upcoming events, etc., and see what the parents see. View all activities uploaded by them. List of students in grades/classes assigned to them. Every teacher also has a web login which they can sign-in from www.lernio.in using their email address. Once a teacher account is created, the teacher will receive a welcome email on their email address. The web login is used for uploading assignments with option to attach documents (like PDF, weblink, word document, image, video, etc.) to each assignment.